Restores optical clarity to clear & tinted plastics in and around your boat canvas, automobile, aircraft, recreational vehicle, home, warehouse, restaurant, grocery store, trade show and any where plastics are used. Our evaporating formula is a non-abrasive, anti-static, anti-fog, fingerprint resistant product line that does not steak or swirl. It is safe to use indoor and outdoor and is not harmful to children, pets or aquatic life. 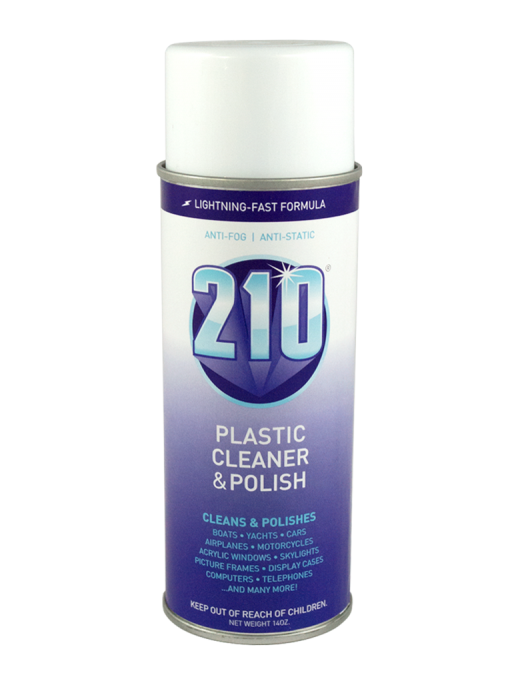 210 Plastic Cleaner not only cleans off oxidation, stains, glue residue and paint over-spray, but seals the pores of the plastic keeping the plastic cleaner, making future cleanings easier. 210 Plastic Cleaner gives you a long lasting, durable shine every time. Our products can be used to clean plastic, isinglass, lucite, lexan, plexiglas, acrylite, chrome and painted surfaces.